For many, fall is all about football, when fans can revel in college and professional games on television or walk over to their local high school to enjoy a big Friday night match up. Over the years, Amtrak has often marketed its services to football fans, especially in cases where stadiums are conveniently located near stations. In the 1970s, Amtrak promoted the Panama Limited (Chicago-New Orleans) as a great way for residents of western Kentucky, Tennessee and Mississippi to reach New Orleans for Saints home games. 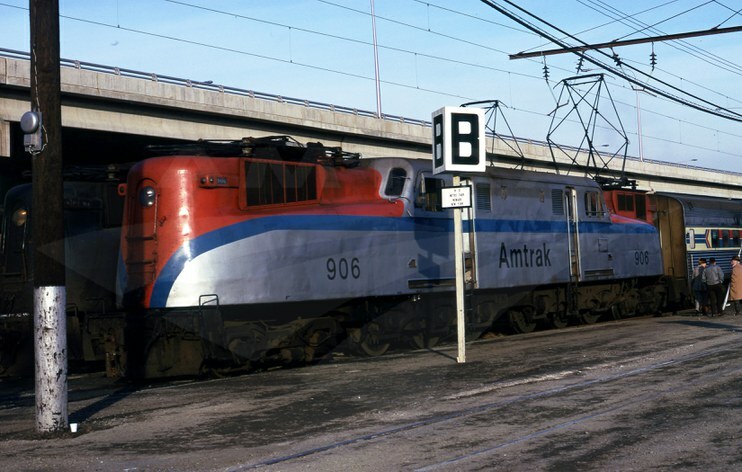 Amtrak encouraged folks to “take our stylish Amfleet cars,” which entered into service in 1975. Their modern styling and comfortable seats were a major improvement over the older cars the company had initially purchased from the predecessor railroads. Passengers could board late in the evening for a mid-morning arrival at the grand New Orleans Union Passenger Terminal, which is only a short walk to the Superdome. An Arkansas rail group appropriately called “Hogtrain” chartered an Amtrak train over New Year’s 1980 to transport about 550 fans from Little Rock to New Orleans for the Sugar Bowl game between the University of Alabama and University of Arkansas. According to Amtrak NEWS, the so-called “Sugar Bowl Express” consisted of two locomotives, five Amfleet coaches and two Café cars, as well as Hogtrain’s private car, the Cynthia. Playing off the festivity of the event and New Year’s Eve, the “Sugar Bowl Express” included a Baggage car “converted into a disco car” where passengers could dance the night away. Soon after the launch of the Heartland Flyer (Oklahoma City-Fort Worth) in June 1999, Amtrak and the Oklahoma Department of Transportation added an additional coach to accommodate fans headed south to Dallas for the October “Red River Rivalry” football game between the University of Oklahoma and the University of Texas. The famous match-up began in 1900 and since 1932 has coincided with the popular State Fair of Texas. Based on the success of that trip, the “Big Game Train” continues today. Just this past November, Amtrak and the Michigan Department of Transportation hosted a special “Rivalry Train” that carried Chicago-area fans to East Lansing for the game between in-state rivals Michigan State University and the University of Michigan. Alumni from both schools won tickets to ride aboard a reserved coach car. During the trip, they answered MSU, UM and Amtrak trivia questions, posted fun photos to Instagram and got to know one another in a relaxed setting. MSU also provided goody bags and ice cream. Showing its school spirit, the MSU crowd even belted out a rendition of the university’s fight song. One of the longest running and most famous college football rivalries is between the U.S. Naval Academy and the U.S. Military Academy—the teams play this year’s much anticipated Army-Navy Game on December 14th at Philadelphia’s Lincoln Financial Field. Interestingly, passenger railroads have long been intertwined with the game’s rich history, transporting the teams and spectators. Philadelphia's John F. Kennedy Stadium. The Middies and Cadets first battled it out in 1890 at West Point. Navy, which had been playing football since 1886, easily beat the new, inexperienced Army team 24-0. Stewing in defeat, Army, led by star player Dennis Mitchie, trained for a rematch the next year, in which it won 32-16. A great football rivalry was born. In 1899, the Army-Navy Game moved to Philadelphia, easily accessible from West Point and Annapolis. Two years later, more than 30,000 spectators gathered at the University of Pennsylvania’s Franklin Field to watch the teams square off. Among them was President Theodore Roosevelt, who as commander in chief made a conscious effort to show his neutrality by sitting with each team for one half of the game; this tradition continues today. Since the early 20th century, the Army-Navy Game has largely stayed in the City of Brotherly Love, moving in 1936 to the larger Municipal Stadium (renamed in honor of President Kennedy in 1964) at the southern end of Broad Street. The increasingly popular annual event attracted crowds from across the Northeast and Mid-Atlantic, so much so that the Pennsylvania (PRR) and Baltimore and Ohio (B&O) railroads began running special trains to the stadium, with the former handling more passengers. after the game, it will pull a train of football fans to New York. The PRR initiated special trains following the move to Municipal Stadium, as its Greenwich Yard, a receiving point for coal and iron ore, bordered the site directly to the south. The B&O dropped off and received passengers on the west side of Broad Street. Whereas Franklin Field was close to passenger rail facilities in Center City and West Philadelphia, Municipal Stadium was located approximately four miles south of City Hall and the PRR and B&O stations. Trains approaching from Washington and New York used freight-only trackage to cross the Schuylkill River and reach the stadium. From New York, they left the main line and traveled over the West Philadelphia Elevated Branch (also known as the “High Line”) in order to bypass busy 30th Street Station and cross the Arsenal Bridge. Once across the river, trains traveled down the Delaware Extension, an elevated right-of-way over 25th Street, before swinging east to reach Greenwich Yard. Workers prepped the freight yard for the special day by cleaning up the tracks and constructing walkways to direct passengers to the stadium. Each track received a letter designation to help passengers locate their trains once the game was over. Between 1946 and 1953, an average 21,700 coach and Pullman passengers traveled directly to the stadium via the PRR each year. Pictures from the time show up to 40 trains, many led by electric GG-1 locomotives, parked two or three to a track. 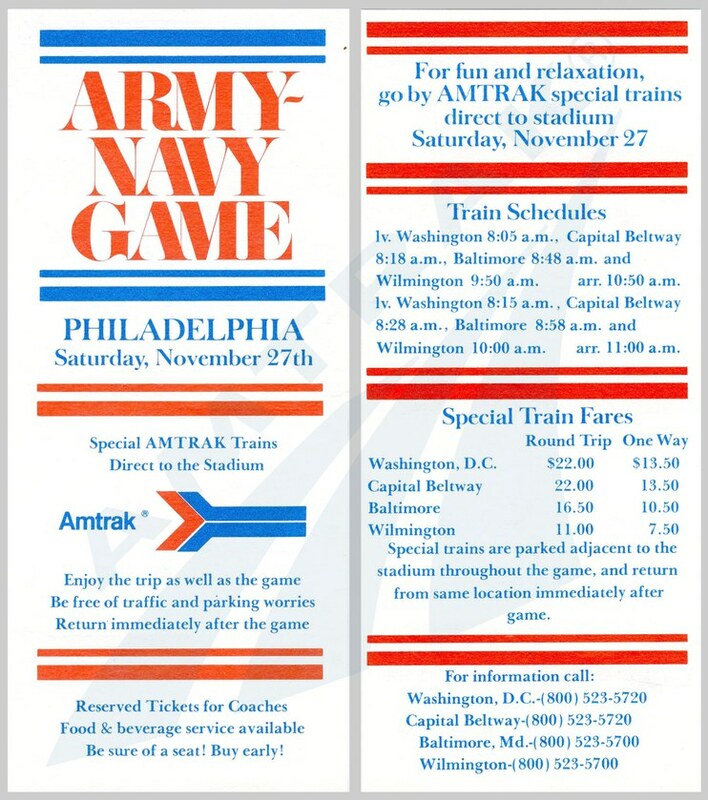 Amtrak stopped running the Army-Navy Game specials by the 2000s, but in 2005, and in several years thereafter, it has welcomed the “Liberty Limited” over its tracks. Created by businessman Bennett Levin, owner of the Juniata Terminal Company, the train consisted of restored vintage rail cars belonging to Levin and others. From Washington, it carried members of the armed forces wounded in Iraq and Afghanistan to Philadelphia to enjoy the game. The train was led by Levin’s two EMD E8 locomotives; originally built for the PRR, they have been restored to their original Tuscan red livery. Private cars making up the “Liberty Limited” included the Little Juniata Rapids, North Star, Kitchi Gammi Club and Chapel Hill, among others. Representing the continuity of history and railroad traditions, Levin’s PRR Business car no. 120, built in 1928 as a rolling hotel and office space for railroad officials, had once carried President Kennedy to the Army-Navy Game. In February 2014, Amtrak will carry fans to Superbowl XLVIII, hosted by the states of New York and New Jersey. With events planned for Newark, New York City and of course MetLife Stadium in East Rutherford, Amtrak and public transit agencies are working closely with the NY/NJ Super Bowl Host Committee to ensure fans easily reach their destinations. 1 National Railroad Passenger Corporation, “Seattle Stadium Means Increased Business,” Amtrak NEWS, October 15, 1977. 2 David S. Martin, “Battle stations! Army and Navy girding for annual Philadelphia battle,” Rome [Georgia] News-Tribune, December 5, 1986. Kirkbride, John J. (1989). "Army/Navy Game Trains." The High Line, Vol. 10 (1 and 2), 3-14.